Union County, NJ – Municipalities across Union County can look forward to improving recreation opportunities for youth and expanding their tree canopies, with the help of two countywide grant programs, the Kids Recreation Trust Fund and Greening Union County grant programs. 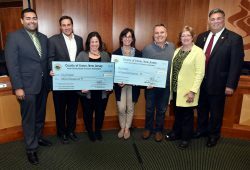 Both grant programs are awarded by the Freeholder Board through the Union County Open Space, Kids Recreation and Historic Preservation Trust Fund. They provide matching funds to assist communities with projects that meet local needs. The Union County Open Space, Kids Recreation and Historic Preservation Trust Fund was established by popular referendum in 2000 with an initial focus on expanding and improving County parks. In 2004 the mission was broadened to include Kids Recreation annual matching grants to municipalities for improving local children’s recreation resources, and annual Greening Union County “tree for tree” matching grants for municipal properties. Freeholder Angel Estrada, who initiated Greening Union County as Chairman in 2004, noted that the program has provided funding for 12,214 trees for municipalities since then. Berkeley Heights: $48,367.32 for upgrading several parks, lower Columbia Park and Veteran Memorial Park. Clark: $30,000.00 for update to playground for children’s disabilities, benches, tables and swings. Cranford: $60,000.00 for Memorial Complex, Centennial Pool upgrades, 3 basketball court resurfacing and new play structures. Elizabeth: $90,000.00 for synthetic turf at Sisselman Field. Fanwood: $40,000.00 for playground equipment, rope climbing structure, swings, rubber surface and benches. Garwood: $20,000.00 for a water fountain, shading, basketball hoops and backboards at Hartman Park. Hillside: $9,666.58 for multi fitness stations and borders. Kenilworth: $50,000.00 for rehabilitation of recreation building. Linden: $70,000.00 for rehabilitation of city parks. Mountainside: $38,500.00 for resurfacing, fencing backboard posts at Echo Brook basketball court, lightening detection system. New Providence: $54,000.00 for walking paths and landscaping to enhance Harmony Park (Try CAN). Plainfield: $60,000.00 for handicap accessible playground at Milt Campbell Park. Rahway: $70,000.00 for Madden field baseball and football field upgrades and turf section on school property. Roselle: $54,000.00 for Renovation to Grove Street Park. Roselle Park: $35,000.00 for volleyball equipment, baseball field cover, field tarp storage rollers, bicycle racks and a mobile bandstand. Scotch Plains: $60,000.00 for poured rubber safety surface to Brookside Park playground. Springfield: $30,000.00 for ADA accessible playground structures, benches, new surfacing and walkways. Summit: $55,000.00 for Bocce Court relocation at Community Center. Union: $70,000.00 for Friberger Park basketball court upgrades, picnic area, benches, tables and surfacing. Westfield: $55,000.00 for handicapped unisex restrooms at Memorial Field Complex.